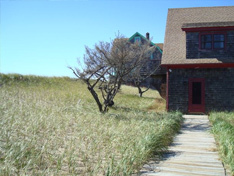 A number of options exist for protection of ocean as well as inland marine shoreline, dune and coastal bank resource areas. 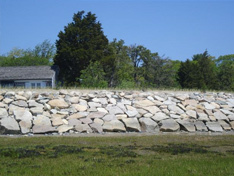 The first category of measures are the use of various types of rock structures including rock revetments, rock walls, rock groins, “T” groins, rock breakwaters, and rock gabion baskets and mattresses. 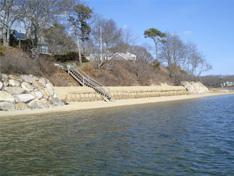 These measures are called “hard” engineering solutions and represent the traditional approach to shoreline and coastal bank protection. 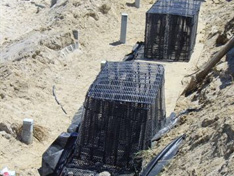 Rock structures, along with sheet pile walls and geo tubes, provide a high level of protection against intense storm conditions. 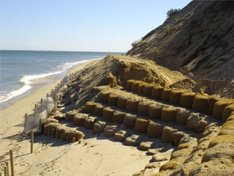 However, a growing concern among coastal engineering professionals is that hard engineering measures may in fact be accelerating erosion due to increased wave reflection and/or the impact of such structures altering natural shoreline processes. 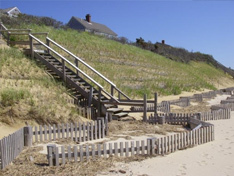 In response to the concerns about hard engineering structures, a second and growing category of shoreline, dune and coastal bank resource stabilization measures are so called “soft” engineering measures. These measures focus on the use of biodegradable materials such as jute and coir products. 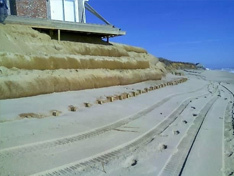 The most common measures are the fabrication of jute and coir mats into large envelopes and bags which are then filled with locally compatible beach sand and constructed into terraces extending up the face of the coastal bank. These “softer” materials tend to absorb wave and surf impacts, help encourage sand accretion and result in reduced wave reflection. Coir and jute envelopes and mats can be planted with locally indigenous vegetation to restore a coastal bank and, due to its original vegetated condition, has benefits for bird and wildlife habitats and provides a more ecologically friendly, finished condition. Finally, coir envelopes and mats are, in some areas, looked upon more favorably since the sand contained in envelopes and bags will at some point be available for beach nourishment as the biodegrading process occurs. 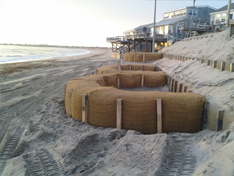 NETCO can construct both traditional rock installations as well as the emerging “soft” protection systems of coir and jute envelopes and bags. NETCO has developed a system for fabricating coir and jute envelopes into measures that can withstand high energy storms. 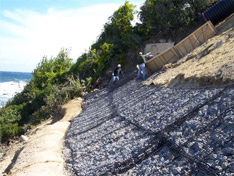 We would be pleased to discuss in detail the application of either “hard” or “soft” engineering solutions for your specific erosion condition.